We live in a town that hosts one of the top 10 rodeos in the U.S. This is a really fun time of the year for the whole town. It is bursting at the seams with excitement and people from all over. 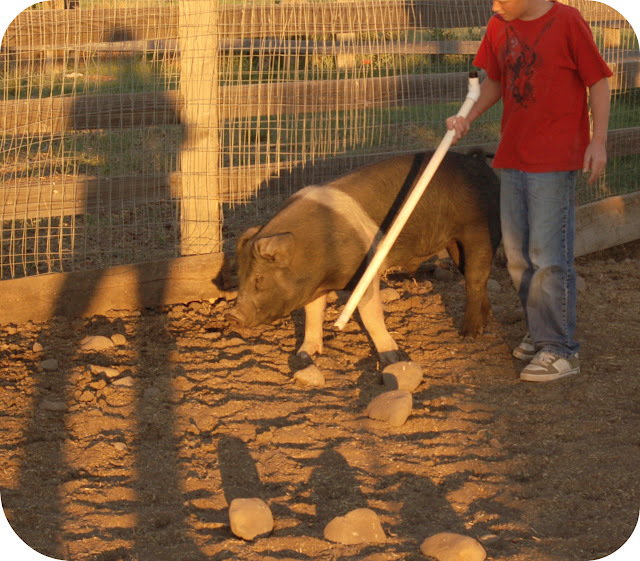 Our boys are showing their pigs this year in 4-H and will be a big part of the Fair going on at the same time as the rodeo. I love small town life. They are excited and have been working so diligently with their pigs...Hamilton, Oreo, Tuffy, and my personal favorite... Doris. She is quite the piggie. The boys have spent hours with their pigs and they are all so tame. Don't worry....the little white plastic stick is to gently tap on their shoulders to tell them to go left or right:). No one gets hurt! OK...I know they are tame, but I am not sure you are supposed to do this:). Oreo is sturdy enough...it is quite the ride. Hamilton will lay on his back for you to scratch his tummy. 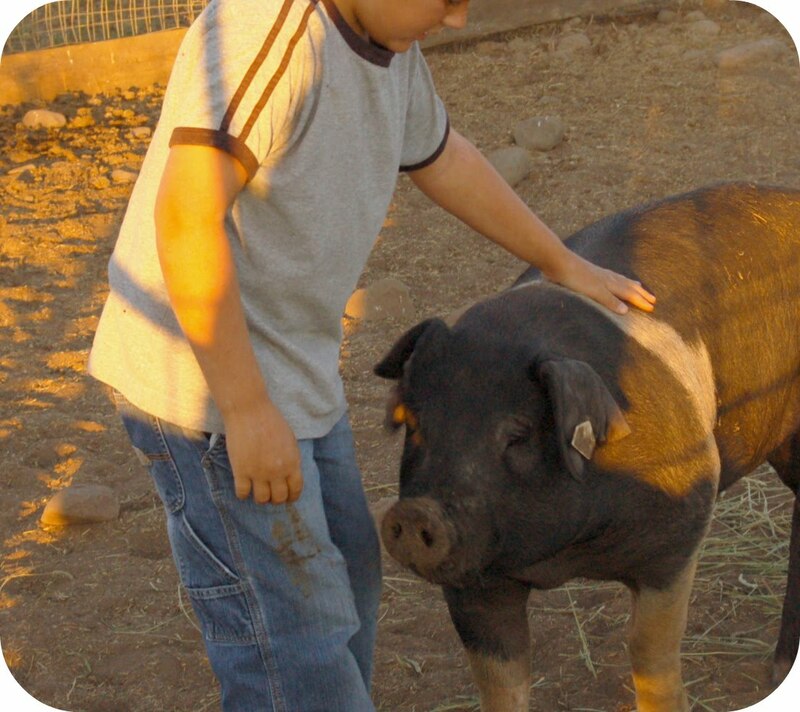 I was so impressed that the pigs are gentle and friendly. 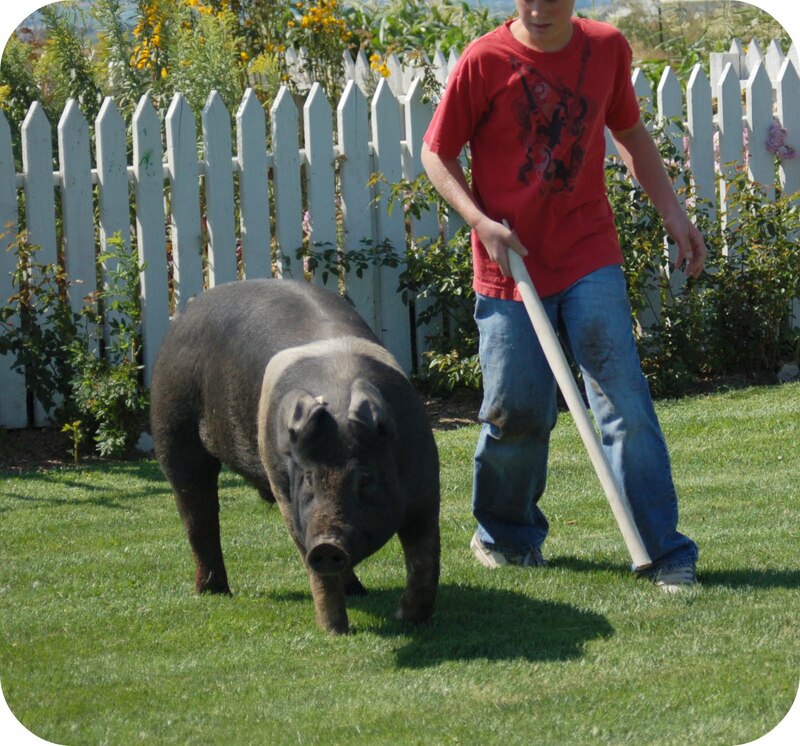 It has been a fun project this year and I am so looking forward to them showing and selling their pigs. The kids will have to be at the fairgrounds 6am-9pm everyday...6 days total. Irrigating and other animal chores are still going on, so that means some of us will be up at 4:30 am all week. Whew! The whole town participates in buying from the kids to support 4-H. The auction is intense and fun all at the same time and the kids really make quite a bit of money. Will is hoping to buy a larger motorcycle and put a little in savings. Tim is buying another cow. That kid is bound and determined to have quite the herd by the time he is a teenager:). 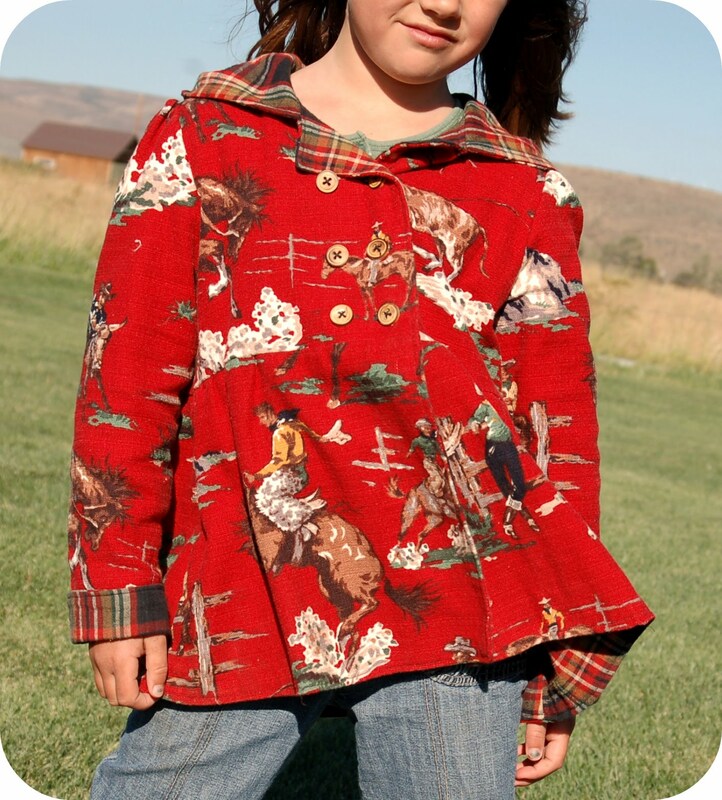 I made Lily a little jacket for the cooler evenings a little while ago for our week at the fairgrounds. She loves to ride our pony, Chip, and is quite a little cowgirl. We thought a rodeo theme was in order. 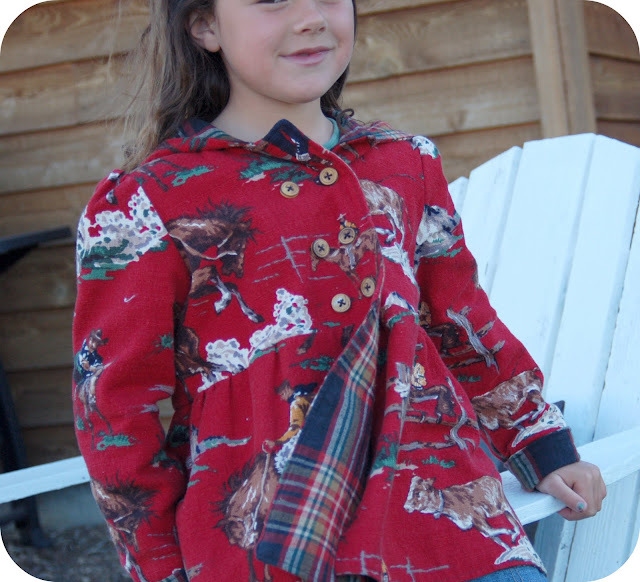 The pattern is from Burda and was fairly easy to sew. My sister made one for her shop and left out the elastic at the wrist. I copied her idea and liked how it looked rolled at the cuff. It is really warm and comfortable. The fabric is a linen blend from a local store and the liner is a nice flannel from Joann's Fabrics. It wears so well and washes beautifully. PS: I have had a request for a pattern number:). The jacket is from Burda #9567. Hope that helps and thanks for all of your sweet comments:)!! I am linked up at these great places. I remember my sheep and goats from my 4-H days my favorite sheep was a ewe named Elvira (remember the Oak Ridge boys). I had a goat named Peanut who was Reserve Grand Champion. We kept her and she was a great milker. I always feel like I get to spend a few minutes on vacation when I visit your blog. Even though we have a little property, we certainly don't have a clue about farming. Raising animals, farming the land, participating in rodeos, it just appeals to me so much. Maybe someday.... the jacket is darling - makes me want one for myself. It's mostly still in the high 90's around here, but today was cooler and the evening seemed like a bit of fall, perfect for a little flannel. You did a wonderful job! Don't lose too much sleep getting up so early. Holy moly, I have to get up at 6:45 now that Kindergarten started and it's killing me - I'm so not a morning person. 4:30? multiple days in a row?? good luck!!! Cute hometown pictures. Love the country life. That jacket is adorable. I mean really really cute. Good luck with your 4H projects. Looks like they have fun with the pigs. Aren't pigs supposed to be really smart? Cute jacket..you did a nice job. Let me know if you make the burlap/shabby rose bag. I would absolutely LOVE to see your finished project and hear how it went! 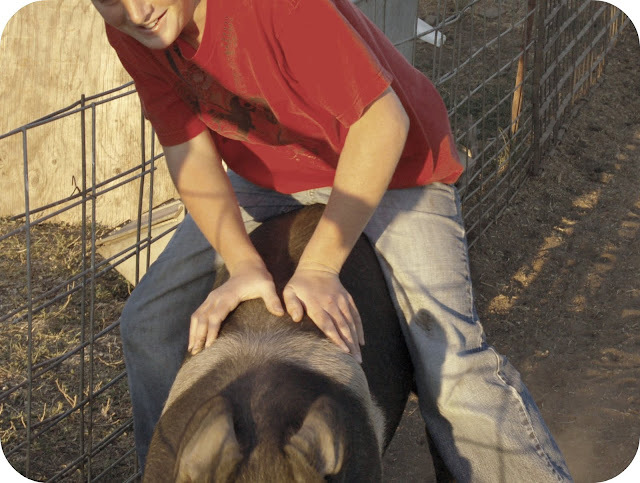 Raising animals was my "thing" when I was in high school in our small town. Whew! That was a long time ago now . . . it is was so much fun!! Oh how I do love that rodeo fabric. I've seen it in our local quilt store; I am definitely going to have to buy some now. The jacket is truly fabulous! You latest follower. I am having a giveaway over at my place. Come join in! What a lovely jacket. We also live in the country and have had our county rodeo this last week...although ours is on a much smaller scale. I hope the pigs and kids did well. so nice to stop by here!!! It sure looks like your boys are having a good time. I love the shirt you made for your daughter, the fabric is perfect! Thanks for linking. Found you via Train to Crazy. You did a beautiful job on this jacket. Well done! The jacket is beautiful! What a fun life you guys have. Great jacket! 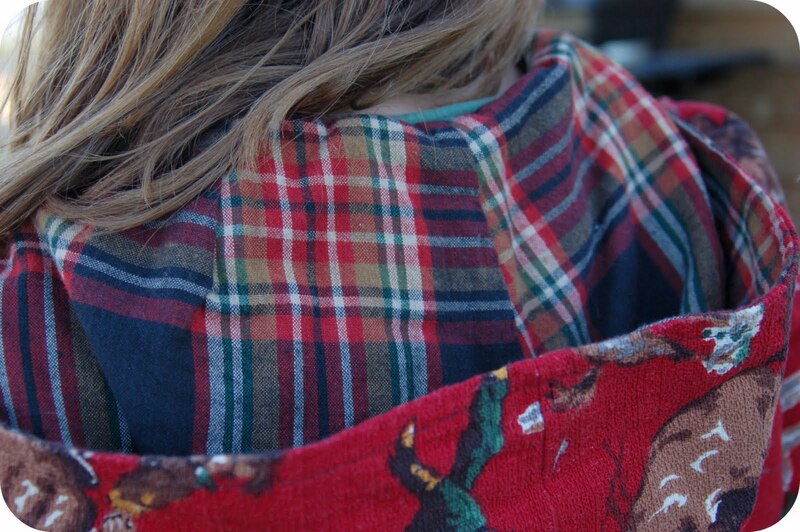 Love the plaid lining with the rodeo fabric! Thanks for showing the pigs! That is precious! I love the fabric. You did a fantastic job! Your daugher's a lucky girl! That is a darling jacket, and your daughter is so cute! Those piggies stole my heart. I have always had a fondness for pigs. Not sure why, except I think they are really cute. The swine barn is always one of my favorite stops at our fair. Best of luck to your children at the auction! I just wanted to let you know, I featured your daughter's shirt last week. My daughter loved this coat when she saw it. Do you know who the fabric is made by? I am having a hard time finding something similar.